Switched up as to who was in what vehicle, ladies in one and guys in the other. Sj driving the rental car and doing a mostly passable job though it may just be that ra and th were too polite to say anything, may not have been quite as centered in the lane as one would want nevertheless fun conversation in one car and silence in the other. 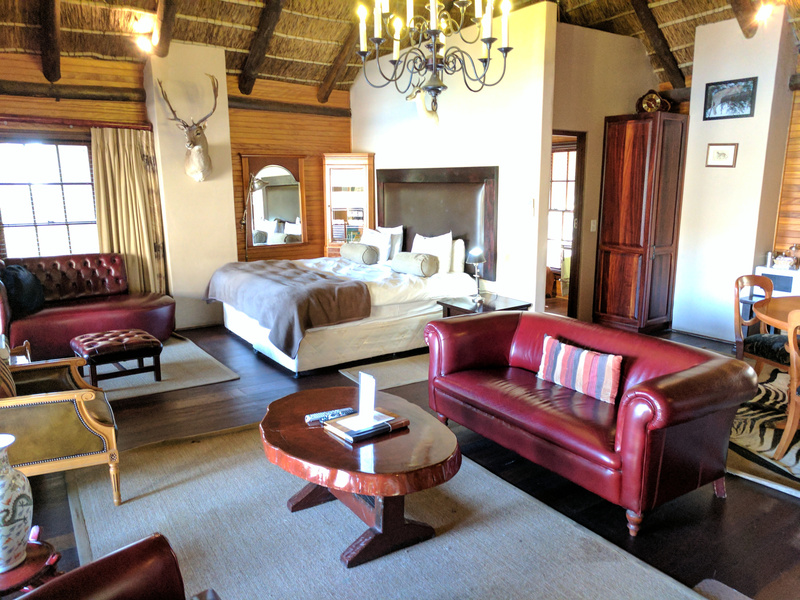 Plan for the day called for driving to Franschhoek where we had reservations at Chamonix wine estate for the night. The goal was to take the wine tram and do some wine tasting. Ladies in one vehicle and guys in the other. Chamonix wine estate turned out to have its own mini game reserve, this because the owner was evidently a big hunter (as determined by the number of stuffed animals and photos of him with his kills that decorated the property). 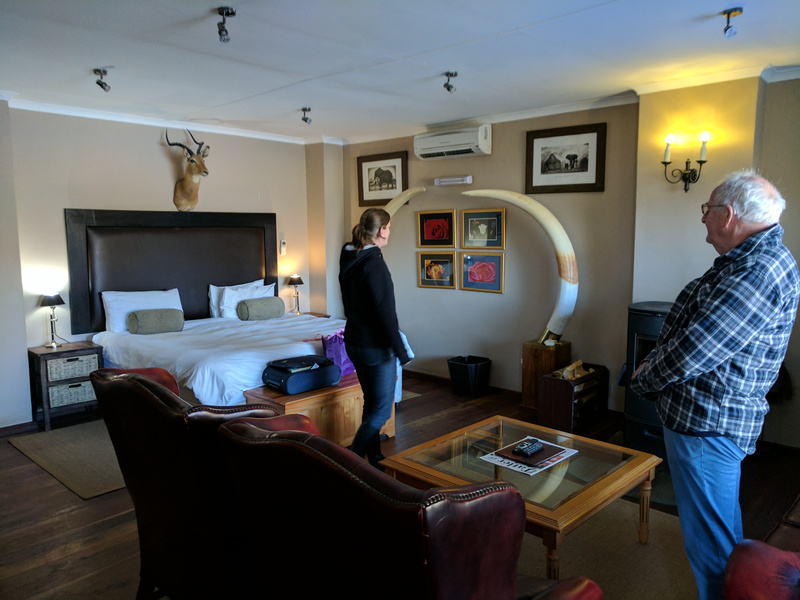 As a result the estate actually had its own mini game reserve and we were very excited to learn that our rooms were in it. 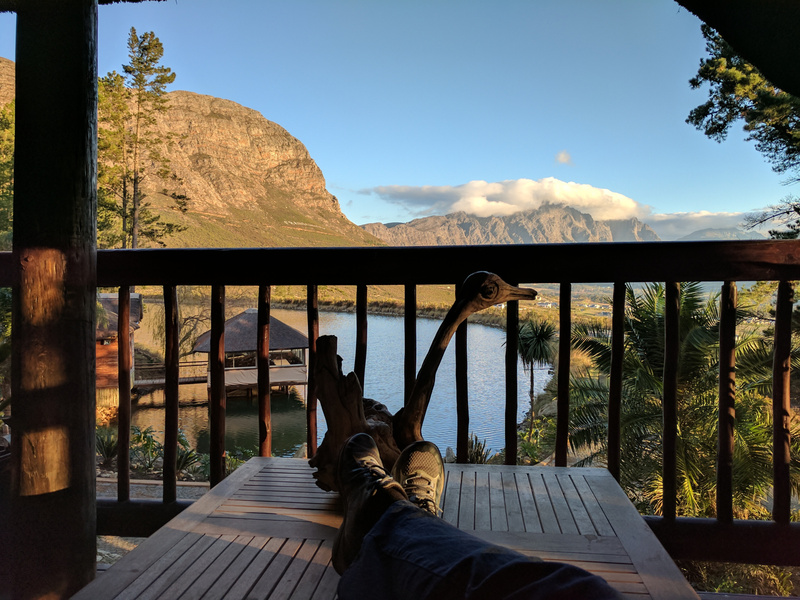 We were apparently some of the only guests on the property (and the only ones staying in the game reserve) so we had been upgraded, the manager escorted us (in a convoy of cars) onto the reserve and then had each of us select a random key. The ts ended up in one of our original rooms, and after determining that we were never sleeping in a room under Rosemary ever again s/j traded keys with cj. 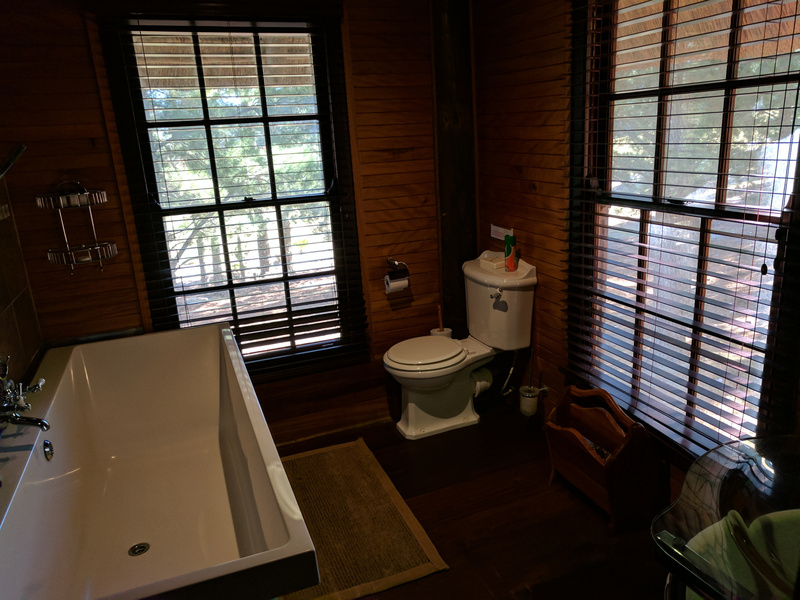 The ts room was right on the lake with a door that opened directly onto it. Their building featured a ping pong table and so they proceeded to spend a lot of time playing ping pong. The rest of us were in a large building with two floors, each of which contained one large room. Th very pleased to discover that unlike the rest of our rooms, hers didn't have any stuffed animals. Heading up the stairs to s/js room you encountered 4 stuffed animals overlooking the porch alone and quite a few more inside. Most disturbing was the zebra head in the far corner of the room and the zebra skin rug on the floor. 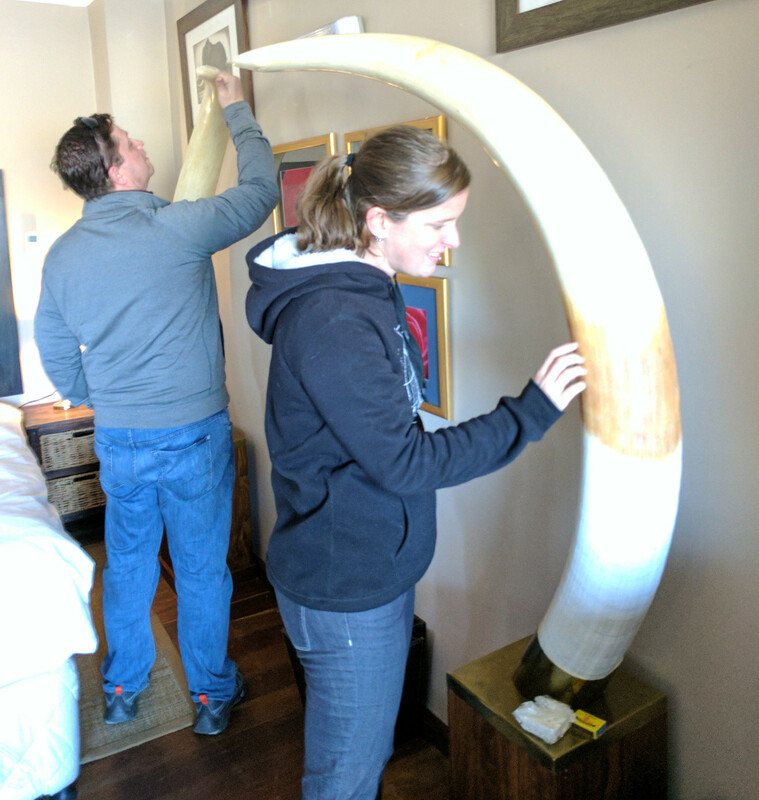 Worse though were the pair of gigantic tusks in ra and cj s room. They couldn't possibly be real but were still pretty alarming. 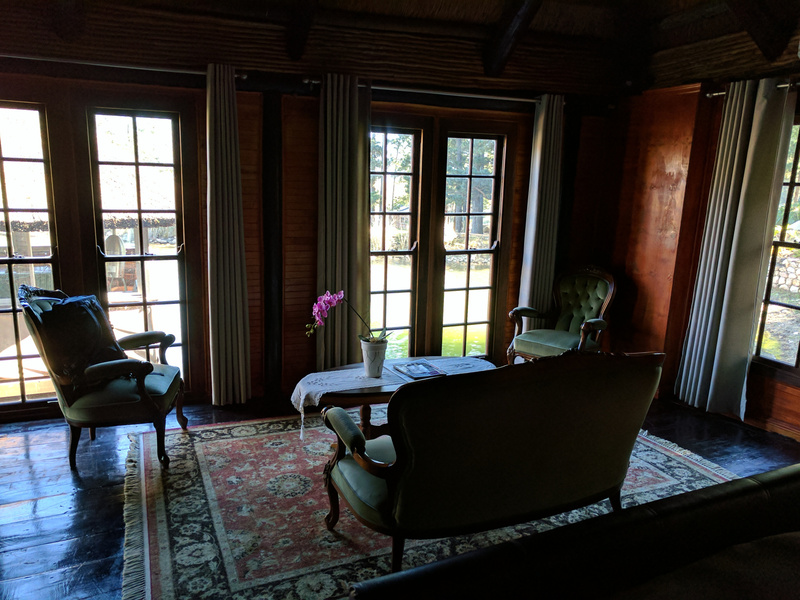 The ts room was right on the lake with a door that opened directly onto it. The rest of us were in a large building with two floors. but we were well warned not to try them out too close. 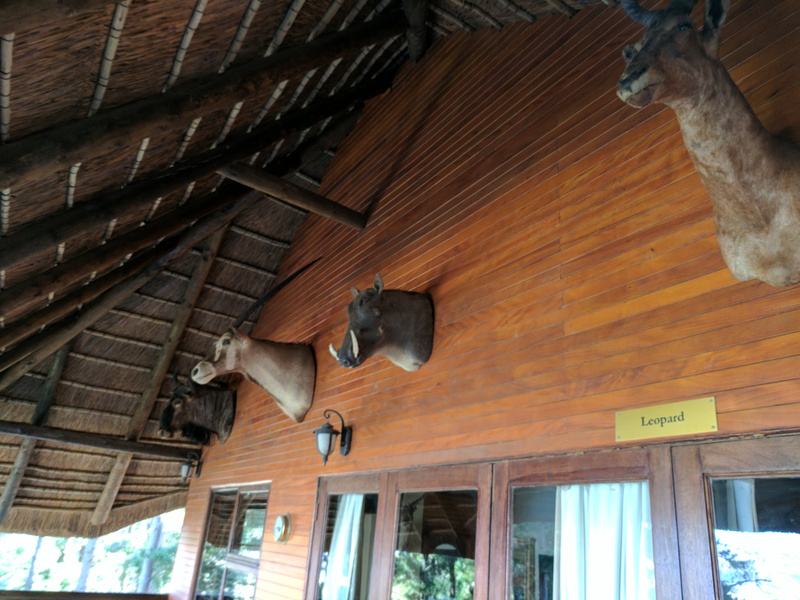 Upstairs you encountered 4 stuffed animals overlooking the porch alone and quite a few more inside. 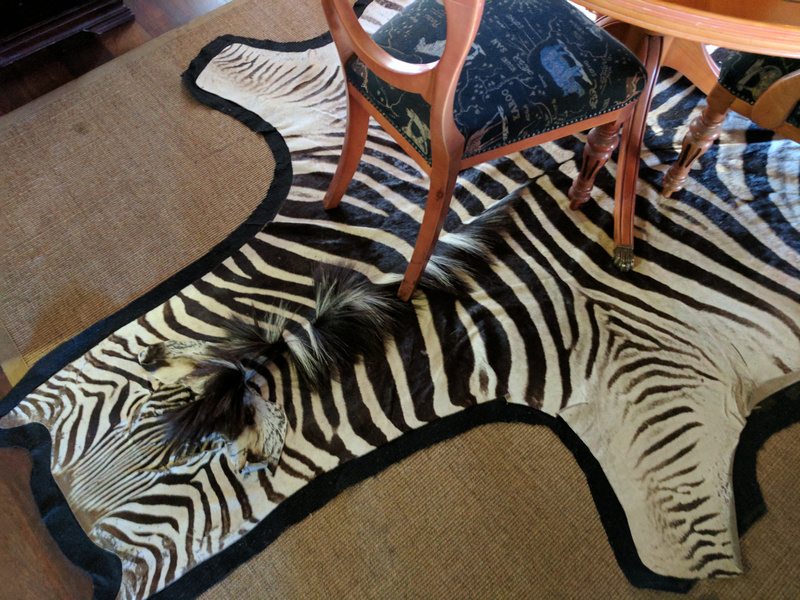 Most disturbing was the zebra head in the far corner of the room and the zebra skin rug on the floor. Even more alarming a deer with not much between its ears. Our accommodation very far from the main gate of the estate so dropped our things and decided to leave our cars at the gate and then proceed on foot to the wine lodge where we thought we would be able to buy tickets for the tram. In this we were wrong as it wasn't actually possible to buy tickets for the wine tram onboard so leaving the ts and ra at the estate's tasting room the rest of us headed into town to get tickets for the wine tram. Apparently the wine tram didn't work quite as we expected, it wasn't a hop on hop off bus so much as a one way route and at noon we'd just missed the last one for the day. Headed back to the tasting room to meet up with the rest of the group and break the news. They'd decided to split a wine tasting and were in the middle of it so after some discussion decided that maybe we should start with lunch so adjourned to the attached restaurant to do just that. When we were done decided to walk into town after all. Ts and cj found a pub that served beer, while the rest of us headed off to wander around town. Wandered around for a while before deciding that since we'd had a late lunch, rather than having a real dinner we'd just buy a variety of nibbly bits and some wine. Rest of the afternoon spend back at Chamonix. Ts played ping pong, s/j hung out on the second floor of the porch watching the animals. Decided to start with lunch so adjourned to the attached restaurant to do just that. s/j hung out on the second floor of the porch watching the animals. and the view as we headed towards sunset. 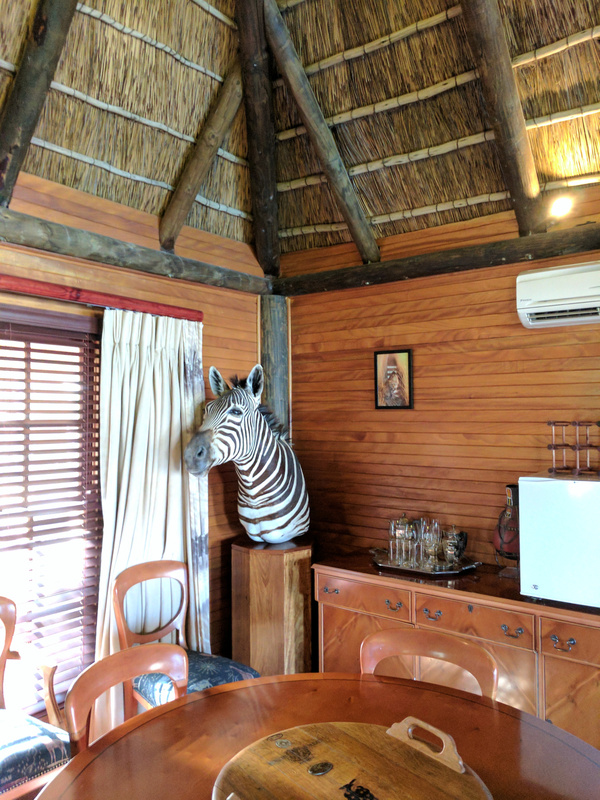 It turned out that there were a variety of animals living in the reserve, ostrich , wildebeest , springbok , gemsbok , eland (which a sign warned us could be aggressive) and a ton of zebra . The first time I went to Germany with a group of students I stayed at a house overlooking a farm and my co-teacher and I used to sit on the porch watching cow tv for hours at a time, this was just like that only with a zebra channel. 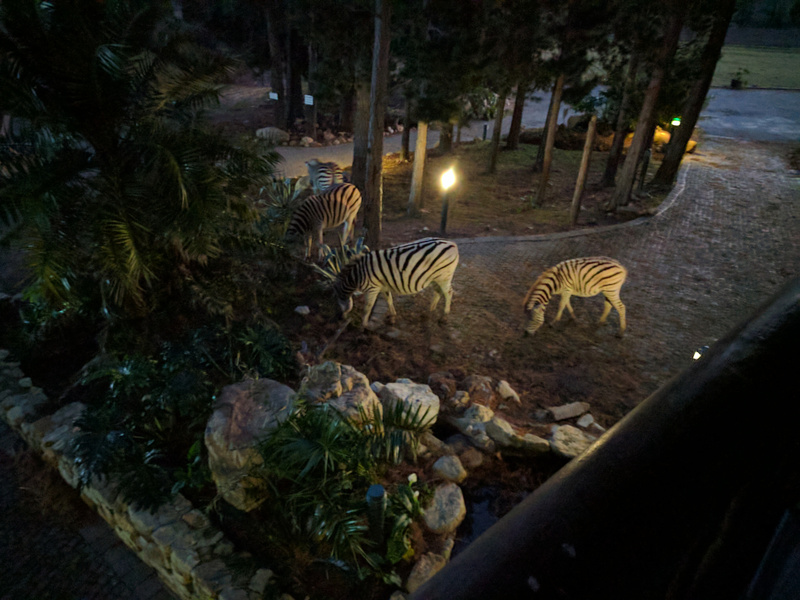 There were a series of small ponds on the side of the building and as dusk fell the zebras approached them to drink before making their way slowly around the lake. 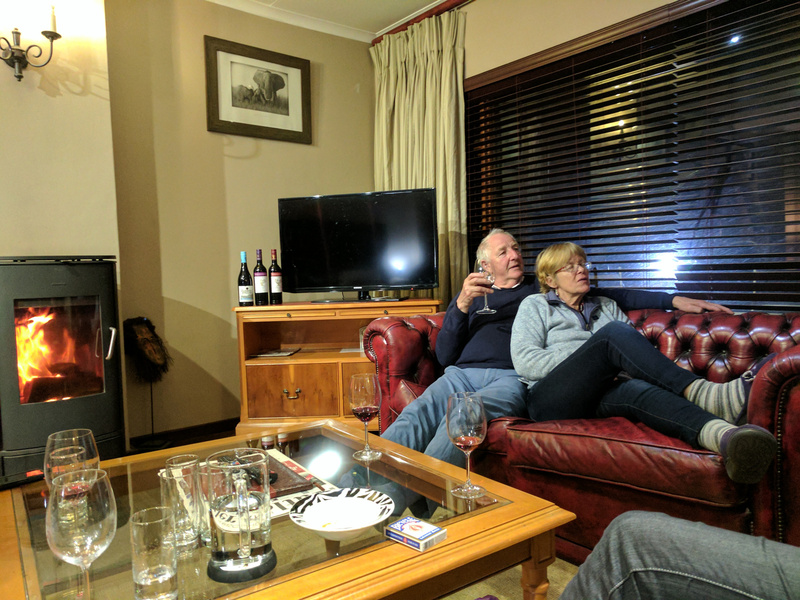 When it was too dark to see them any longer we headed down to cj's room, where tw (our sommelier though better known locally as our our smellier) was about to conduct a private wine tasting. In addition to cheese and hummus, we'd apparently also acquired several bottles of wine and one at a time tw was directing us to sample them. 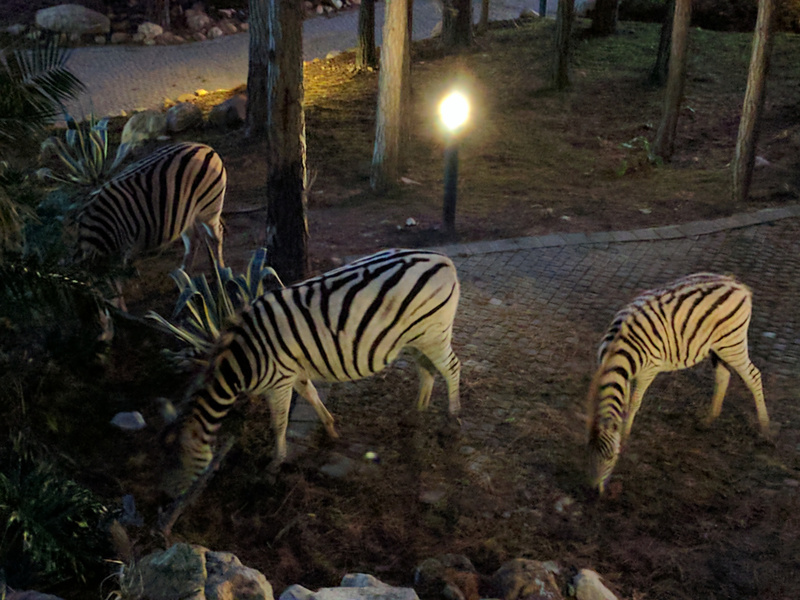 as dusk fell the zebras approached to drink before making their way slowly around the lake. tw (our sommelier though better known locally as our our smellier) was about to conduct a private wine tasting.